Discover IBOCO's full line of I-Flex Liquid–Tight Connectors, which are available in both light Grey or Black. Our non-metallic liquid tight connectors are used in completion of our I-Flex Liquid–Tight PVC electrical tubing. 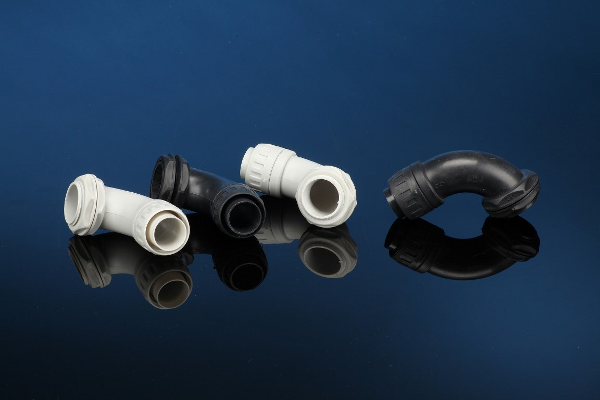 Material: Our I-Flex Liquid–Tight Connectors are all made of PVC plastic. IBOCO®'s straight and right angle (90º) liquid-tight non-metallic connectors are designed to fit with the company's line of flexible liquid-tight PVC tubing in order to ensure leak-proof integrity on motors, processing equipment, pumps, etc. Some of the main applications for I-Flex Liquid-Tight Connectors include the following: Protection of fiber optic cables, Wire harness protection, Marine applications, Packaging equipment, Installing instrumentation or control cables, any applications where oil resistance is required, or where water corrosion or ultraviolet light is a major problem. Our connectors are suitable for indoor as well as outdoor applications. I-flex Liquid-Tight Connectors have an adjustable collar which makes them very easy to install. Operating temperature range from -4ºF to +140ºF. Solvent, grease, oil, alcohol, gasoline, and saltwater resistant. If you have questions, please feel free to start chatting with us through our live chat. You can also contact your local representative or the IBOCO sales office for additional information about IBOCO's I-Flex Liquid-Tight Connectors.